Are missing teeth making you feel self-conscious about your smile, or keeping you from eating comfortably each day? Dental implants are the most advanced tooth replacement option available to the modern dental patient, and have become the standard of care for patients with missing teeth. 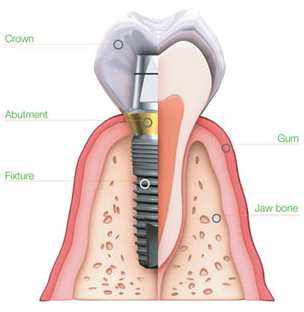 Having dental implant treatment allows you to benefit from a brand new tooth that looks and feels natural. 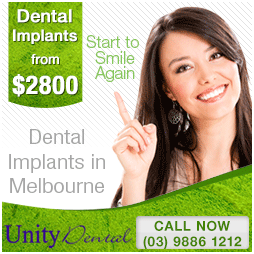 Unity Dental in Melbourne offers comprehensive dental implant treatment all in our one office location. The category you may need will be decided by the treating dentists and will be based on factors including but not limited to medical history, site of implant, adequacy of bone in the area and requirement of bone grafting. The type best suited for your clinical situation will be determined by surgeon and restoring provider, we will absolutely provide you with all the choices available within the realm of clinical condition as our aim is to provide the best treatment for your individual clinical requirements. Simple category: Dentium Implantor Blue Sky Bio system used. Molar area implant with less estheticdemand,with adequate bone density may be an example of simple category. Advanced category: Advanced and complex categories will use implants from Ankylos/ Nobel Biocare Implant System. Front tooth implant with reduced bone availability may be an example of advanced category. Complex category: Front tooth/molar implant with inadequate bone, requiring bone grafting may be an example of complex category. (bone grafting costs not included). Unity Dental will endeavour to provide as much choice to patients as possible between implant and crown types within the limits of their clinical condition and requirements. Prices for dental implants and crowns may be subject to change without notice. A written quote will be guaranteed for 3 months from the date of the quote. Dental implants prevent the side effects of tooth loss — namely, gum recession, bone loss, and speech difficulties. Dental implants can make dentures secure and reliable — say goodbye to messy adhesives and slipping, uncomfortable dentures! During your initial visit, our Doctors will evaluate your bone and gum health. This is to determine the condition of your general and oral health, to enable you to be a good candidate for dental implants. One Body Implants are Single-Stage Dental Implants: A single-stage dental implant procedure involves surgically placing a longer implant into the jaw so it is on the jaw bone, with the top of the implant level with the gum tissue, after which the gum tissue is closed (stitched), leaving the implant head visible. As a result, after several months of healing, the dental implant abutment and temporary restoration can be attached without the need for minor surgery to expose the implant head. This mini dental implant system is minimally invasive and immediately stabilizes loose dentures using a protocol, often without a flap and sometimes even using the patient’s existing denture. The lower denture presents the most difficulty for patients adjusting to dentures for the first time or for experienced denture wearers. It can be frustrating as you attempt to eat certain foods, or even to speak with confidence without fear that your lower denture will begin to float or become loose in your mouth. The mini implants system consists of a miniature titanium implant that acts like the root of your tooth and a retaining fixture that is incorporated into the base of your denture. Placement of the implants is accomplished quickly and easily in a process performed in the dentist’s office. The procedure generally takes just over 1 hour. It is a one step procedure that involves minimally invasive surgery.